The Community Foundation of Louisville believes it’s our responsibility as a community to enable art by enabling working artists. We are thrilled to partner with Creative Capital to invest in Louisville’s working artists. On Sunday, October 21, 2018 we welcomed 15 Louisville-based artists to the Hadley Creatives community at a reception at 21c Museum Hotel. 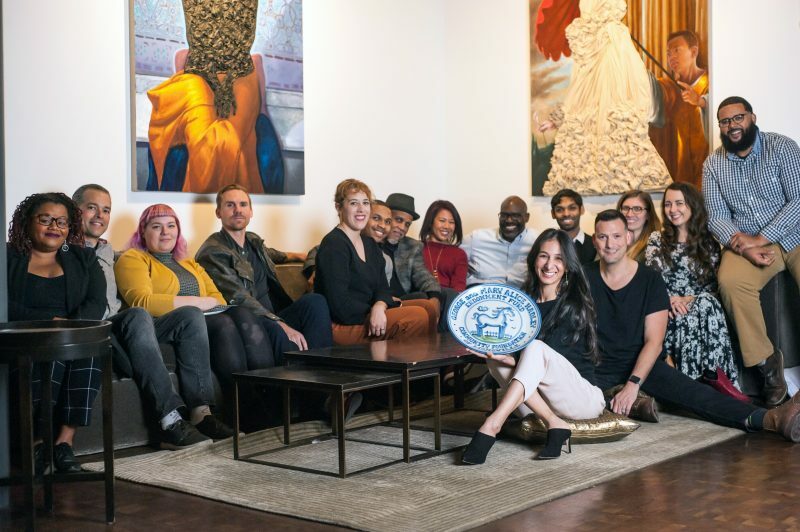 The 2019 Hadley Creatives Class, our second cohort, is a continuation of CFL’s commitment to cultivate the Hadley Creatives Community through 2023. Through a competitive application process of 42 applicants, these artists demonstrated a strong, creative vision and a readiness to pursue a career as a working artist. All were able to articulate a meaningful pivot point in their careers. The six-month program will help them capitalize on this pivotal moment by building their professional practice, cultivating an expanded peer network, and dedicating time for reflection and planning. The professional development program will be led by Creative Capital and supported by Louisville’s cultural arts, business, and civic leaders. Creative Capital is a New York-based nonprofit that supports innovative and adventurous artists across the country by surrounding them with the tools they need to realize their visions and build sustainable careers. Creative Capital artists will lead the 2019 Hadley Creatives Class in a 2-day professional development retreat beginning November 10 at 21c. During the weekend retreat, the 15 participating artists will attend sessions on strategic and business planning, securing funding, and communication for artists. The group will then meet monthly to further develop their professional skills with support from Louisville’s cultural, civic, and business leaders. Hadley Creatives is supported by the George and Mary Alice Hadley Fund at the Community Foundation of Louisville. Mary Alice Hadley, founder of Louisville’s Hadley Pottery Company, believed in making opportunities for artists to thrive. The George and Mary Alice Hadley Fund at CFL was created to honor her legacy and to support artists and arts organizations throughout Louisville. The Community Foundation designed Hadley Creatives as a way to nurture creative professionals and support a thriving arts economy throughout Louisville.